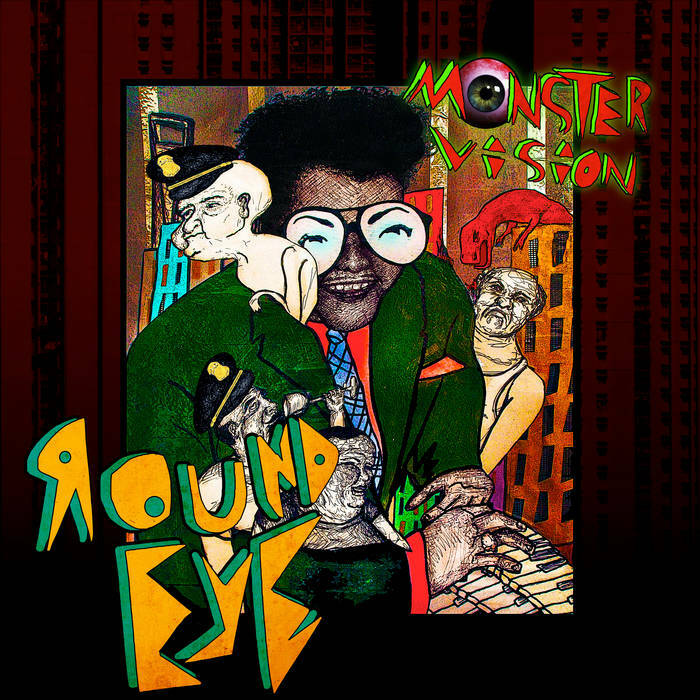 Round Eye has been cooking up Monstervision for quite some time, though perhaps the election of Donald Trump gives the album's off-kilter alternative universe a more unnerving basis in reality. Intercut with monologues from the fictional Monstervision's host (and real former Daily Show correspondent) Joe Bob Briggs, Monstervision is a pulsating ride through Round Eye's darkened vision of American culture and the world at large. Briggs' mild-mannered, off-color, down-home humor juxtaposes the disarming American ego with Round Eye's furious id. Combining punk beats and wailing saxophone solos, Round Eye gives the impression of a ska band going through an inspired but bad acid trip. Something fundamentally had gone wrong. pallid muscles in the arm of the law. G.I. Joe, an American hero, Billy! Billy: Billy was a cop. Freedom is a cop. Are the things that really make this land great, oh yeah! Much like the campy horror movies the original Monstervision TV show played, the album is full of incomprehensible goofiness, earnest commentary, and a strange intensity that twists a pit in your summit. But at the end of the day, it's all fun and games.